Artist’s impression of the ASTRO-H observatory. Credit: Akihiro Ikeshita / JAXA. A University of Southampton researcher will explore the structure and evolution of the Universe, as part of the ASTRO-H X-ray space telescope mission that launched in Japan today (17 February). Dr Poshak Gandhi, Associate Professor and STFC Ernest Rutherford Fellow in the University’s Astronomy Group, is one of over 200 astronomers from over 60 contributing institutions in Japan, the US, Canada and Europe involved in the major international collaboration. It is led by the Japan Aerospace Exploration Agency (JAXA) and also includes NASA and the European Space Agency (ESA). The satellite has now been renamed ‘Hitomi’, which means eye in Japanese. The Japanese have a long tradition of renaming satellites post-launch, giving a ‘proper’ name instead of the ASTRO series label. The aim of the new satellite is to study hot and extremely dense objects in the universe, such as black holes and clusters of galaxies. Most of the largest, growing black holes are hidden behind thick interstellar gas and dust clouds and using X-ray observations is the only way researchers can directly study many of them. ASTRO-H will enable better X-ray spectroscopy of black holes than ever before. Dr Gandhi has been a member of the ASTRO-H mission since 2010. He will participate in two ‘science task forces’, focused on understanding how black holes accrete matter from their surroundings and grow, and to study the interaction between black holes and the galaxies in which they live. Dr Gandhi adds: “One part of research focus at Southampton is the study of growing supermassive black holes at the centres of nearby galaxies. As Superman’s X-ray vision allows him to peer through walls, so ASTRO-H’s X-ray vision will be able to penetrate the veiling clouds surrounding black holes and will also be sensitive to any light reflected and scattered by these clouds. Hard X-ray imaging system - consists of a Hard X-ray Telescope (HXT) and Hard X-ray Imager (HXI). Soft X-ray imaging system – consists of an imaging mirror, Soft X-ray Telescope (SXT-I) and Soft X-ray Imager (SXI). Soft X-ray Spectroscopy System - consists of the Soft X-ray Telescope (SXT-S), the Soft X-ray Spectrometer (SXS) and the cooling system. These technologies will allow ASTRO-H to split X-ray light into its component colours, similar to a prism with sunlight. This will be achieved by detecting miniscule heat changes generated by individual incoming X-ray photons. This will enable measurement of the energies of X-ray photons to better precision (at least six times better) than any other satellite and allow researchers to distinguish many more ‘shades’ of X-ray colours than has been possible before. By analysing the X-ray energies, researchers will be able to determine the elemental composition, dynamical state and temperature of matter in these extreme and hot objects. ASTRO-H was launched into low-Earth orbit from the Tanegashima Space Center, Japan, by a JAXA H-IIA rocket on 17 February 2016 at 08:45 GMT/15:45 JST. This is a rescheduled launch following the postponement of the first launch on 12 February. The mission will last for three years and ASTRO-H observing time will be available for any scientist across the world through a competitive, peer-reviewed proposal process. 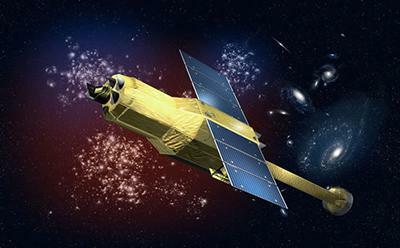 It is the sixth satellite in a series of highly successful X-ray astronomy missions initiated by the Institute of Space and Astronautical Science (ISAS) of JAXA.